Is everyone getting excited for the holiday season? We are! I am starting a new feature with my newsletter - a Pic O' the Month - scroll down to see it. 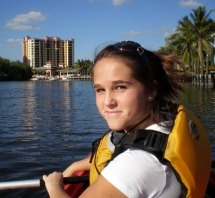 When we stayed at Marina Village last month, we heard about the Geopaddle, a scavenger hunt by kayak. I decided that sounded like fun, so Nicole and I went. We rented a kayak there, were given a map, and had 2 hours to find clues that were on buoys in the river, which we had to hand in for a prize. We found our clues in about half an hour and spent the rest of the time paddling around and exploring. We even paddled all the way to Rumrunners in Cape Harbour. Needless to say, we had sore arms the next day, but it was a lot of fun, and we hope to do it again next year. We didn't win the big prize, a 2-night stay at the resort, but we got free gelato, which was delicious! The Coconut Festival was the next big event. 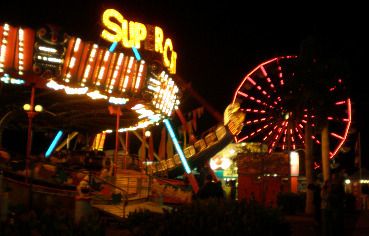 My kids always have a blast on the rides, I like the rock concert, and we all enjoy the food. They had some of the best fireworks I have ever seen. The festival opens on a Friday in mid-November, and has local bands playing that night. Saturday night is rock night, and Sunday has country music in the afternoon. This year Foghat took to the stage. They were opened by an AC/DC tribute band called Back in Black. I have videos of both bands and of the rides on my YouTube channel. 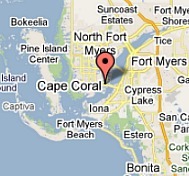 For other festivals in Cape Coral, go to the festivals page on my website. Earlier in the month, we went to Pasta Night at Cafe Pignoli, down in Cape Harbour. It was delicious! You get a choice of 4 different kinds of pasta, 4 different sauces, and vegetables and meat to mix in. They cook it up for you right there and while it's cooking, you can help yourself to Caesar salad, sausages, meatballs, and garlic bread ..... the meal is all-you-can-eat for the very reasonable price of $11.95. We want to go back for Friday night BBQ, karaoke on Saturday night, and the Sunday Jazz Brunch. Motown music is performed on Wednesday nights. While at Pignoli's, we found out about an opportunity to serve the community. Pignoli's served 350 gourmet Thanksgiving meals to those in need: the poor, the lonely, and shut-ins. We signed up and our task was to wave a sign about the event on a busy intersection to people driving by. It wasn't too bad, the hour went faster than we thought it would.... got a little sunburnt! We then went home and cooked up our own dinner. Hope you all had a nice Thanksgiving ..... love that turkey dinner! The last thing we did this month was to go flats fishing, in other words, we went fishing close to shore. 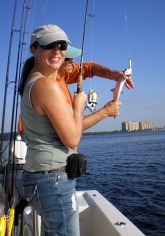 I thought it was a lot of fun, I caught 4 fish: 2 ladyfish, a Spanish mackerel, and, believe it or not, a puffer fish! Captain Gary from Venture Out was terrific, he showed us how to cast and reel, he's a really nice guy. Next year we want to go further out, now that we got our feet wet ....... get it?! For videos of each of us catching a fish, go to my YouTube channel. Don't forget, you can also go to my blog to see updates to my website. Speaking of websites, I built mine with SBI!, which stands for Site Build It! If you are interested in building a website, SBI! is offering a Buy One Get One Free sale until midnight December 25th, 2010. SBI! teaches you how to take an interest, passion, or hobby, and turn it into a profitable online business. The regular price for a website from SBI! is $300. 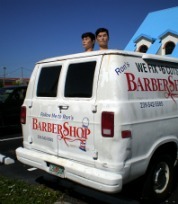 You may be wondering what to do with 2 websites. You can split the cost with someone else who wants to build a website, or you can keep both. You have 9 months before you have to activate the second site, and then a year after that before you need to build it. 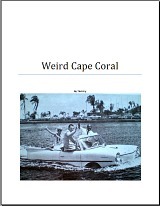 I just finished writing my ebook Weird Cape Coral. I am offering it at no cost to subscribers of Gator Bites. I will sending an email with download instructions to those who subscribed before this month, so they can get a copy of the ebook. 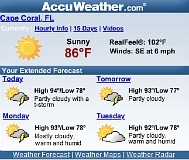 Happy Christmas shopping and decorating, safe travels, and when you get too cold, come to Cape Coral. Next month we are hoping on going to the Christmas boat parade, the tree-lighting ceremony, try out another restaurant, and maybe even stay in one of the Cape's accommodations.